"I have used this for years. 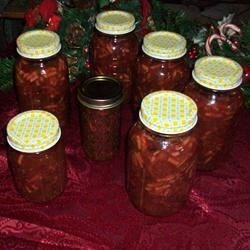 If you are a connoisseur of mincemeat, you will be able to tell this is a good recipe while you are cooking it, and you add the spices to the fruit, and it magically changes to that wonderful aroma of....mincemeat! If you want to, you can omit the meat in this recipe. I prefer peach or apricot brandy for this recipe. If desired you can use half beef and half pork rather than all pork." Get the lowdown on how to make marvelous mincemeat tartlets. While I am sure the recipe tastes fantastic, it is not safe to can in a waterbath. Any meats need to be pressure canned. I would not recommend processing this recipe in the manner described. My grandparents never canned it. They put this in a crock and let it age with boubon and brandy. They made it in October and let it "marry" until the holidays. Delicious! Next time I make it I will use slightly less vinegar and slightly more sugar, but that might be because I used fresh sour cherries (perhaps they are more sour than canned??? ).